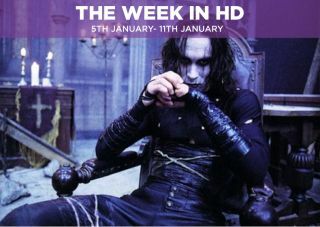 The Week in HD - Monday 5th January | What Hi-Fi? The FA Cup weekend spills out into the week as Liverpool travel to AFC Wimbledon, two teams who contested one of the more memorable cup finals which saw Wimbledon beat the fearsome Liverpool team of the ’80s. The first series gripped a nation. The gruesome murder in a sleepy seaside town made for spectacular, tense drama, and Olivia Colman and David Tennant were magnetic as the two detectives leading the investigation. Can they recreate that success in the returning series? Under the codename 'Tea and Sympathy', series two plot details have been guarded with tighter security than the Tower of London. What we do know is that alongside Tennant, Coleman and a host of recurring cast, new additions will include Eve Myles (Torchwood), Meera Syal (Goodness Gracious Me), and James D'Arcy (Agent Carter). James McAvoy gets beaten up by Angelina Jolie while Morgan Freeman looks on sagely in this action flick about an elite group of assassins who possess the skill to bend a bullet's trajectory. Like Beckham. But with bullets. I Think I'm Gonna Like It Here. After a long spell being absent from UK screens, the long-running supernatural series about two brothers fighting demons, monsters and angels is back in all its glory. It's series nine, and the boys have got the King of Hell locked up in their basement. Mark Sheppard's Crowley is an absolute delight. He warns them that the demon Abaddon, the pretender to Hell's empty throne, is even worse than he is. And so Dean takes it upon himself to stop the hellish overlord, Sam is possessed by an angel, and Castiel needs to find a way to return fallen angels back to Heaven. A year after rock musician Eric Draven and his fiancee are brutally murdered, Draven comes back from the dead as the supernatural The Crow to avenge their deaths. Overshadowed by the accidental on-set death of lead actor Brandon Lee, The Crow nevertheless remains a cult classic for its gothic visuals, great soundtrack and dark storyline. The Long Bright Dark. If you haven't already seen this slow-burning, intricately layered and character-driven HBO show, now's the time to catch up. Set against the sprawling, coastal plain of South Louisiana, the story dips in and out of two timelines (1995 and 2012), as we follow two detectives and their 17-year-long hunt for a gruesome serial killer. Woody Harrelson and Matthew McConaughey are a revelation here; it's their conflicting personalities, their narrative, and their now-fractured relationship that binds the stories and drives this eight-part series. Continues throughout the week. Fantastic film adaptation of Alan Bennett's play of the same name (with the same cast) about a group of unruly yet charming boys in 1980s Sheffield who are being pushed to pass entrance exams to the Oxbridge universities. Taught by three very different but equally passionate teachers, they learn about life and question their world through lessons in history and English Literature. Witty, hilarious, poignant and inspiring - a gorgeous film. Jimmy Carr hosts this 10-year anniversary special of this wacky end-of-year quiz show. The Goth Detectives (Russell Brand and Noel Fielding) are reunited as one of the teams, facing off Jonathan Ross and Warwick Davies, and Claudia Winkleman and Jack Whitehall in answering pop culture and media news questions about the past 10 years. Features Sir Ian McKellen, interpretive dance, and a Dalek. Aisling Bea, June Brown, Seann Walsh and Adrian Chiles try to pass off lies as truths and vice versa in this panel game show where lying is rewarded. Regular captains David Mitchell and Lee Mack, and host Rob Brydon also join in on the fun. Delightfully cheerful and Christie-like murder mysteries set in the stunning beauty of the Caribbean, with a group of lovable characters? We have a soft spot for the charming Death in Paradise, and the fourth series is back with even more creative and fun cases. When the owner of a rum distillery is found murdered during a seance, all clues lead to the perpretator being… a ghost. A head-scratching case for DI Goodman and his team (who are one member short - Fidel, by the looks of the promo photos). An Ordinary Man. King Louis decides he wants to see how the normal folk of France live their daily lives, and goes out dressed as a commoner with D'Artagnan. Of course, they then get kidnapped by slavers and the King realises he will be late for his son's christening if he isn't saved by the Musketeers. New villain Comte de Rochefort (Marc Warren) uses the King's absence to get close to Queen Anne, who's hiding her son's true parentage. Little and Large. Stephen Fry hosts, with guest panellists Lucy Porter and Richard Osman occupying either end of the Little and Large spectrum. Phill Jupitus and Alan Davies join in with interesting facts and japes. Adam Hills, Josh Widdicombe and Alex Brooker return for the sixth series of satirical talk show The Last Leg, with Dara Ó Briain as guest star as they combine social commentary with comedy. Stay tuned for Adam Hills' cheery observational comedy routine in the Happyism Live show. Liverpool's recent form in the league has been erratic to say the least, and with the talismanic Steven Gerrard leaving at the end of the season, it's all a bit doom and gloom at Anfield. Sunderland may welcome the visit of a wounded Liverpool, but the story of their season has been too many draws. Will this be another one? When Norse god of mischief Loki starts to wreak havoc on Earth, the secret organisation known as S.H.I.E.L.D. assembles a dysfunctional group of superheroes (well, eccentric billionaire robot, angry green giant, two assassins, Norse god of thunder and America's supersoldier) to help protect the world. Clashing personalities, wicked one-liners, lots of building-smashing action and the start of Marvel's superpower legacy - we loved Avengers and can't wait for more. The sequel - Avengers: Age of Ultron - is in UK cinemas on 24th April, 2015. The 2015 Masters championship gets under way at the Alexandra Palace with reigning champion Mark Selby heading off against Shaun Murphy. Expect much pensive staring, walking around a table, and waistcoated players trying not to make the same mistake we do and accidentally pot the white ball. Form and Void. The timelines converge in this nail-biting finale, and the two detectives finally come face-to-face with the killer they've been tracking the past 17 years. Will the Yellow King's victims get their justice? And will Cohle and Hart's fractured relationship hold together long enough to expose everyone involved in the cover up? The crazy – but true – story of biker/criminal Sam Childers, who turned his life around by becoming a preacher in Sudan, preventing children from becoming child soldiers. Gerard Butler plays Childers and we'd argue that he's never been better than this portrayal. It's rough around the edges but an uplifting story nonetheless.